Inspired by famed golf courses, Merion and Pine Valley, famed golf course architect Ken Tomlinson designed a real beauty with Tidewater Golf Club. Tidewater is built on a beautiful piece of land that is nestled between the scenic Intracoastal Waterway and Cherry Grove. 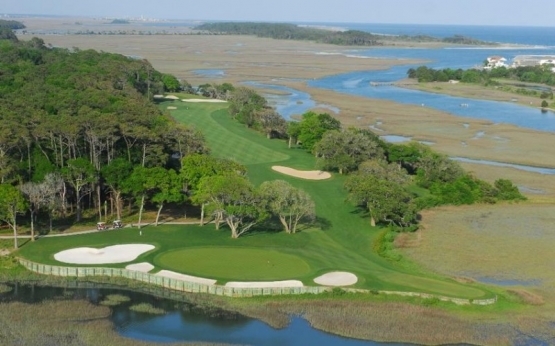 The unique landscape and natural terrain of Tidewater makes it one of the finest Myrtle Beach golf courses. The course has some severe elevation changes that are not always encountered on other Grand Strand golf courses. Tidewater can be a very challenging course as you wind through the many water hazards and strategically placed bunkers. The Intracoastal Waterway, natural marshes and ocean offer outstanding views and are perfect for Myrtle Beach golf photo opportunities. The par-3 3rd and par-3 12th holes are simply breathtaking. Tidewater has beautiful, recently renovated TifEagle greens to ensure that your putts roll true. This challenging golf course has six sets of tees, which makes it playable for all players. The course measures 7,044 from the black tees, 6,771 yards from the blues, 6,323 from the whites, 6,031 from the white/green, 5,735 from the green and 4,648 from the red tees. Many consider Tidewater Golf Club to be one of the premier Myrtle Beach championship golf courses. Myrtle Beach Golf Authority golf packages make booking a North Myrtle Beach and Myrtle Beach golf package simple. They take care of it all from outstanding North Myrtle Beach and Myrtle Beach accommodations to booking your golf tee times. Hassle free. The beautiful practice ranges in North Myrtle Beach makes it a perfect place to tune up your game with a Myrtle Beach golf lesson from a renowned Myrtle Beach golf instructor. Book your Myrtle Beach golf package today! Great layout! Greens need to be redone. Would be a five start course if the greens weren't so bad. Excellent, very interesting layout, great variety, some spectacular holes, turf quality better in 2013, than 2011, good GPS.